Dark clouds formed over Billings, Montana. They eclipsed the moon and the darkest of dark night closed in. Witches cackled, black cats howled, and lighting struck. And then it happened. The most terrifying event in the universe. 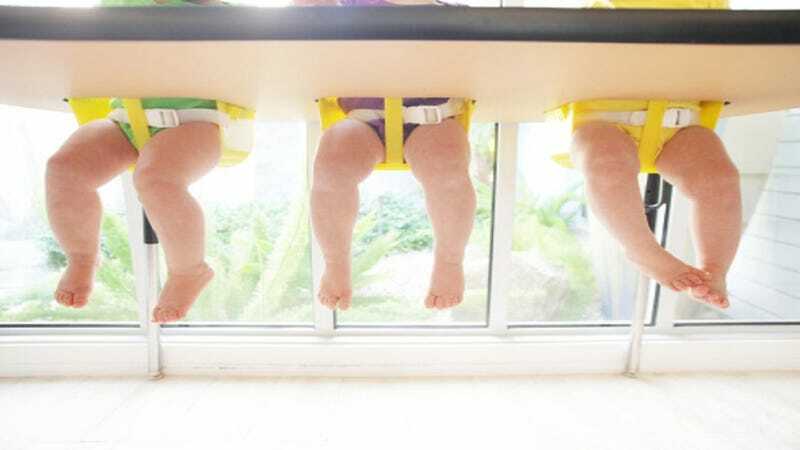 A woman gave birth to unassisted identical triplets. Jody Kinsey and her husband, Jase, welcomed three boys — Cade, Ian and Milo — all terrifying, and all healthy. The triplets actually look like normal pointy-headed, squishy-faced babies, clad in matching blue-striped onesies with ah-dorable bears on their tiny feet. But really, is there anything scarier, than having three identical human beings come tearing from your body? For their part, the Kinsey's aren't terrified at all. Jody, who recently had three tiny, identical monsters in her uterus, told the Billings Gazette "I'm sure it's going to be tough, especially when they get old enough to understand that people can't tell them apart." What's likely to be tougher is when you wake up one early, cold morning and see three identical toddlers staring at you from your doorway. They'll look at you and simultaneously say "Mommy." And then...then you'll be truly terrified.